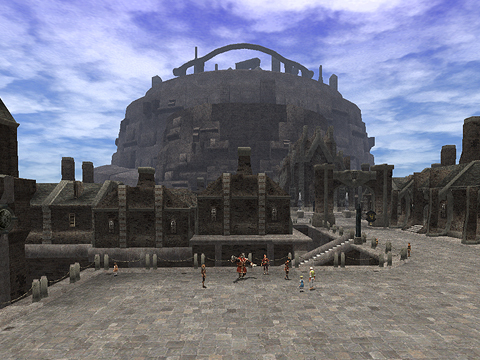 With the release of each version update, Vana'diel continues its transformation into an ever more adventurer-friendly realm. In staying true to this tradition, the development team is working hard on a host of adjustments and additions that will allow our players to focus on what they do best: adventuring! To date, recharging these items required that adventurers call upon guard NPCs located within designated conquest areas and towns. Depending on their current job level, however, adventurers may find these areas to be a considerable time and distance away from their current base of operation. 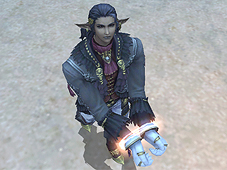 To address this inconvenience, West Aht Urhgan and Past Vana'diel are scheduled to be added to the list of rechargeable locations for the bands. The price of the service in these new locations will be consistent with that of existing areas. That these mysterious containers house an assortment of highly sought-after items such as artifacts and maps is no secret. Such is their popularity among adventurers that those who seek them wishing to acquire the aforementioned items are often left frustrated by others who have different spoils, namely miscellaneous items and gil, in mind. The December version update will see the respawn time for coffers and chests significantly cut specifically for those in the hunt for items such as artifacts and maps. - The sales tax imposed on bazaars will be abolished in all areas of the duchy. - Teleportation to Aht Urhgan Whitegate will be available for mercenaries via the Salaheem's Sentinels representative NPC in Upper Jeuno. Moblin Maze Mongers Set to Open for Business in Jeuno! When a nondescript manhole first popped up one day on the streets of Jeuno, none of us gave it more than a passing glance. Little did we suspect it would be the gateway to a subterranean world of adventure and riches... Today we get up close and personal with the industrious Moblin entrepreneur whose new business venture is set to take Vana'diel by storm. Your intrepid reporter Finleen has the exclusive scoop with Maze Mongers President and CEO Goldagrik right here! At the following time, we performed a version update of FINAL FANTASY XI. The following issues have been addressed in Campaign. -An issue affecting the behavior of freelances. -An issue where Experience points can be obtained multiple times in Campaign Ops "Slaughterhouse I/II/III." Campaign Ops "Slaughterhouse I/II/III" are now available once again. -An issue where NPC in Campaign Ops "Streetsweeper I/II/III" did not appear when players who have accepted a mission from a different nation happens to be in the same area. -An issue where the game may freeze when a spell is casted on a player who happens to be speaking to an NPC about successful Campaign Ops. * This update consists of a version upgrade of the client program (both "Windows" and Xbox 360 versions will not be updated). When you press the play button after the time stated below, the version upgrade will begin automatically. Please follow the instructions on the screen. Starting today, we have introduced a survey regarding all of PlayOnline's services, and we would appreciate your opinions and requests in regards to Square Enix's customer support (such as GM support and the Information Center). We will be using the answers you submit to improve our customer support in the future. Thank you for your understanding and cooperation. The PlayOnline Membership Information section can now be accessed from the web! Starting today, the PlayOnline "Membership Information" section under Service & Support on the PlayOnline Viewer can be accessed from the web. The site is currently limited to viewing specific account data, but in the future, more features will be added and users will be able to purchase Content IDs or change payment methods. PlayOnline "Membership Information" can be accessed here. Pankration (pan-kra-tee-on) is an ancient sport that pits fierce beasts against one another in a winner-takes-all melee. Clawing, cleaving, slicing, striking, enchanting, eviscerating, butting, bashing... Once in the battlecage, anything goes! Does your monster have what it takes to rise to the top? Your first step in becoming a soultrapper begins with obtaining an image of the monster you wish to enter in Pankration. Head down to the Pit with some Imperial credits and purchase a soultrapping device (also called a "Soultrapper") and some blank soul plates. The Soultrapper acts as a type of camera which records the vital information of monsters onto soul plates. Once you have equipped these items in your Ranged and Ammo slots, sneak up on a ferocious fiend and snap away. If you are successful, you will be able to use your newly acquired soul plate to create an item that will allow you to call forth a monster, or apply the monster's skills to another monster. You'll be happy to know that pictures can be taken of most all monsters residing in Vana'diel, even the more "notorious" ones, such as behemoths and rams. Now take your soul plate back to the Pit and trade it along with an ice crystal to the proper attendant. If the plate is one that contains the image of a summonable monster, you will receive a soul reflector infused with the information from your soul plate. But before you can call your monster up for a Pankration battle, you must first submit the reflector for inspection. If it passes all of the Pit's quality assurance tests, it will be deemed an official soul reflector and you and your monster will be one step closer to the battlecage! But what can you do with those soul plates that can't be forged into soul reflectors? Some monsters (such as beastmen) have such strong wills that it is impossible to coerce them into fighting for you. However, that doesn't mean you can't take advantage of their skills and teach those techniques to more impressionable monsters. Try trading one of these unforgeable plates and a reflector to a Pit attendant. If certain conditions are met, the attendant will take the skills from that plate and add them to the monster on your reflector! Imagine the sort of havoc a forest hare with deadly dark knight abilities could wield upon its enemies! As long as there is an opening, soultrappers can enter their monsters in exhibition matches at any time they wish. However, there are no level restrictions in any of the three cages, and no records of winners or losers will be kept. If you wish, you can have your monster pit against the monster of your choice by forming a party with the monster's owner and reserving an entry slot for your opponent when submitting your application. Pit your monster against the current cage champion. If it wins, it is declared the new champion and will continue to battle opponents until it is dethroned. How many matches can you win? When your monster's match is about to begin, you and your opponent will be paged. Proceed to one of the cage officials and you will be transported to the control platform where you will be able to give simple orders to your monster via the speaking tubes. Once the battle begins, the monsters will fight it out until one collapses, with the one still standing declared the victor. If both monsters are still alive when the gong sounds the end of the round, the creature with the most HP remaining is crowned the winner. Adventurers whose monsters are not currently participating in a match can take in all the excitement of the other matches from an elevated stage in front of each battlecage. Once your battle has ended, trade your official reflector to a registration officer to confirm match results. Only after confirming match results will you receive your reward and your monster earn experience and skill points. DO NOT forget to complete this process! In addition to earning EXP through participating in Pankration matches, there are other methods through which your pet can become stronger. All monsters have unique inherent characteristics such as abilities, battle techniques, and magic spells. These are known as "feral skills." However, certain skills often remain dormant until monsters attain a certain level. It is not always a good idea to dismiss a monster as weak until you have had the chance to see it perform at a level where it can call upon a full arsenal of skills. A monster's temperament directly affects how it acts during battle. For example, a tame and defensive monster may choose to use stunning techniques on an opponent attempting to cast a powerful spell or use a weapon skill. 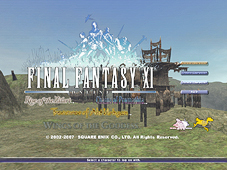 The next FINAL FANTASY XI version update is scheduled to take place on Sep. 10, 2007. Following are the details on features that will be implemented on next version update. Details for the maintenance schedule will be released once they become available. - Adjustment on the accuracy of weapon skills "Guillotine" and "Penta Thrust." - Monster ability statistics are lower than intended. - Ability statistics of Automatons and Pets are lower than intended. - Graphic of Goblin Bounty Hunter continues to appear even after it is defeated. - Players are unable to correctly enter Hazhalm Testing Grounds when checking the "Entry Gate" without a "Glowing Lamp" in their possession. - All random number calculations for damage amounts are not being calculated properly. - Amount of damage is not being corrected properly when characters are equipped with two-handed weapons. - Both the attack and accuracy of monsters equipped with two-handed weapons are higher than intended. - The TP of beastmaster's pets slowly continues to decrease while they were not engaged in battle. - Attachments do not function properly when Automatons have both "Stealth Screen" and "Optical Fiber" attached. - Automaton continues to cast magic on player characters that are KO'd. - Under certain combinations of heads and frames, Automatons will try to cast spells continuously. - When a "Chocobuck Slip" and Chocobucks are both traded, players may be able to carry more than the maximum allowed Chocobucks. - When "Tandjana Wildgrass" is used during the Chocobo Hot and Cold Game, the cursor pointing to the treasure chest will not appear if the cancel button is pressed at a specific time. - Macros might not function depending on how the name of certain items are included. * To avoid this issue, please enter item names either in abbreviated format or by using the auto-translate function. - When entering text commands, shortcuts such as "" will not function properly if a phrase using quotation marks (') is included. 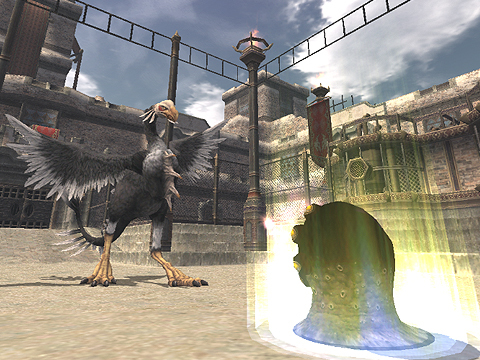 The August 27, 2007 FFXI saw the addition of the Chocobo Circuit, the final Treasures of Aht Urhgan missions, revamping of two-handed weapons, and many more additions and changes. This compilation of info reflects the additions and changes from the August 27 patch. Latest Update: All weapons are now in; the next update will contain all the new armor. Forum Patch Discussions Please post in the appropriate posts below, with any new information from the patch, or any corrections to this compilation of info. The final chapter in the Treasures of Aht Urhgan missions has been added. - The Chocobo Circuit has opened! - The Chocobo Circuit can be entered from Southern San d�Oria, Bastok Mines, Windurst Woods, Port Jeuno, and Aht Urhgan Whitegate. - New items are available at the VCS Chocobuck Exchange Depots. - The maximum number of chocobucks a player can carry has been increased from 100 to 1000. - New temporary abilities are now gained when fulfilling certain conditions. It is now possible for chocobos to temporarily gain the Treasure Finder ability. Chocobos that already have "Treasure Finder" will have the effect of the ability temporarily doubled. A bonus will be granted to rested chocobos that improves their chances to "hit the jackpot" and also increases the number of times they can dig. - Treasure chests found during the Chocobo Hot and Cold Game will now also contain �chocobuck slips� that can be exchanged for chocobucks. Trade your chocobuck slips to the VCS Chocobuck Exchange Depot NPC. - A chocobo�s ability to sense treasure will now also be limited by the relative vertical distance as well as the horizontal distance from a treasure chest, i.e. standing on a hill high above a treasure chest location. - If the beastmen forces are not defeated by the Empire or capture the Astral Candesence, they will now automatically retreat one Earth hour after their arrival in Al Zahbi. - Additional temporary items will now be distributed to players every time a certain number of beastmen and monsters have been defeated. - The offensive and defensive capabilities of the Serpent Generals have been enhanced. - The damage caused by monsters using the ninja ability �Mijin Gakure� has been adjusted. Players now have the opportunity to attain the new mercenary rank of First Lieutenant and gain access to new items purchasable with Imperial Standing credits. New quests have been introduced in the Treasures of Aht Urhgan areas. Drop rates for the quest items ancient papyrus and exoray mold have been improved. The relative strength of the quest monsters (Boreal Hound, Boreal Coeurl, and Boreal Tiger) has been reduced so that a party of six level 51 characters will be able to defeat them. *The quest monsters mentioned above will use the ability �Doom� if the battle continues for more than thirty minutes. Players will now be able to access their Mog Lockers at nomad moogles after selecting the option to increase Mog Locker availability. The location of the Imperial Army officer Asrahd in Aht Urhgan Whitegate has been switched with the event replay NPCs Prillaure and Tsih Kolgimih. The locations of the archaic mirrors on Arrapago Reef have been adjusted. - Five new missions are now available for players with the rank of First Lieutenant. - Players who have completed every Assault mission (i.e. the missions appear on the �Complete� list) will be rewarded with an extra Imperial Army I.D. tag to be held in reserve for them at the Commissions Agency. - The HP of all monsters in the Hazhalm Testing Grounds has been reduced. - An issue with the monster �Hildesvini� not correctly summoning chigoes has been addressed. In exchange for the loss of data after clearing Floor 100 during the Assault mission �Nyzul Isle Investigation�, the chance for obtaining the armor pieces has been increased to 100%. The party that defeats the monster required to cause �Despot� to appear will now automatically claim the NM. - Goblin Bounty Hunters will now appear in the Sauromogue Champaign and the Korroloka Tunnel in locations where it is possible to fish. - The patrol route of Goblin Bounty Hunters in the Valkurm Dunes has been altered. - Two-handed weapons will now receive larger benefits from a character�s attributes, and will also inflict more damage when facing higher-level opponents or enemies with high defense. - A new type of equipment known as �grips� can now be equipped in the sub-weapon slot while using a two-handed weapon. *Grips cannot be used without a two-handed weapon equipped in the main weapon slot. **TP will be reset when changing or removing grips, in the same manner as for main weapon equipment changes. The chance for the additional stun effect of the abilities �Shield Bash� and �Weapon Bash� to occur has been greatly increased. In addition to this change, the help text for the following pieces of equipment has been changed to �Bash�+(number) to reflect an increase in �Bash� damage. - Pets summoned with the �Call Beast� ability will now remain for a longer period of time. *Duration varies for each type of pet. - Pets not in combat will now gradually regain HP. It is possible for a beastmaster to increase the rate at which a pet regains HP by using the �Stay� command. - Beastmasters will no longer be subject to an experience point penalty while using a charmed monster. The job ability �Convergence� will now only affect �magical� blue magic spells. The effect of �Convergence� will also no longer lose potency against high-level opponents. Another level of the dragoon job trait �Accuracy Bonus� has been added. - The effect of �Phantom Roll� has been greatly increased. - The length of time a character remains immobile while using the �Phantom Roll� ability has been reduced. - The job ability �Fold� will now always remove the �Bust� penalty first. - Two new varieties of automaton heads have been added. "Soulsoother C-1000 Head (White Magic)"
The automaton will perform actions such as restoring HP and removing status ailments for its master, as well as other party members, in response to the situation and the maneuvers used. "Spiritreaver M-400 head (Black Magic)"
The automaton will utilize high-level elemental spells, as well as dark magic spells such as Drain and Aspir. The maximum limit for the automaton melee skill, ranged skill, and magic skill has been increased. In accordance with this change, the skill limit will now be calculated depending on the combination of an automaton�s frame and head. *The skill limit will never drop below the current maximum value regardless of the frame and head combination. New equipment has been introduced. New goods have been added to the shops in Nashmau. Large quantities of steel bullets can now be bundled into bullet pouches. The attributes for corsair bullets have been changed. The additional effects granted by attachments will now be displayed within the item help text. A change has been made to the types of items obtainable after appraising the �??? Box� (found during Assault missions). The icon for beastmen's seals has been changed. - The FINAL FANTASY 20th Anniversary and FINAL FANTASY XI 5th Anniversary logos have been added. - Logos will appear translucent if the respective expansion pack has not been installed. A new text command �/translate� has been introduced. 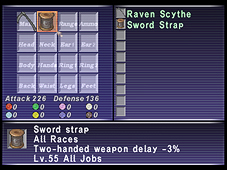 Using this text command, players will be able to see the translations for item names in Japanese, English, French, and German. Translated terms will be automatically added to the auto-translate dictionary under the category �Items�. *This text command currently functions for item names only. **It is also possible to translate from another language into English, provided the term is spelled correctly. ***The term to be translated can be marked with either single or double quotation marks. Mithra and Galka will now close their eyes while in the healing position. An issue wherein the screen would turn black and prevent the player from taking actions during event scenes in Aht Urhgan Whitegate has been addressed. An issue concerning an incorrect number of victories in the defense of the capital being displayed on the Caitsith World has been corrected. The grand opening of the Pit has been delayed to allow for further testing, and is currently scheduled for release on September 11. Further details on the Pit and the monster battle system known as �Pankration� will be available in the very near future. 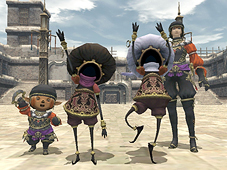 At the following time, we will be performing FINAL FANTASY XI maintenance on all worlds. During this period, FINAL FANTASY XI will be unavailable. Also starting from 8:30 PDT on Aug. 27, application for World Transfer Service will be unavailable. * For the update details, please refer to "Topics" on the official PlayOnline.com web site or PlayOnline Viewer which will be available on Monday, Aug. 27, 2007. At the following time we will be conducting PlayOnline server maintenance. During this time, PlayOnline, FINAL FANTASY XI and Tetra Master will be unavailable. Additionally, "FINAL FANTASY XI Linkshell Community Beta version" as well as the services that are accessible from the official PlayOnline homepage (http://www.playonline.com/) will be unavailable for the duration of the maintenance.